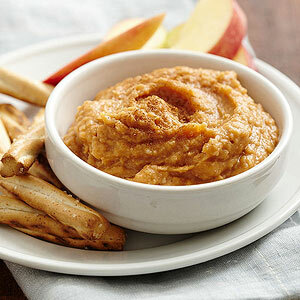 Satisfy your sweet-salty afternoon cravings with this nutrient-packed dip, made with canned pumpkin, white beans and maple syrup. It's fab with honey-wheat pretzel twists, and very kid-friendly. In a food processor, combine all ingredients; puree until very smooth. Chill for up to 4 hours, if desired. Sprinkle with additional pumpkin pie spice, if desired. Serve with sliced apples, pears and/or graham crackers.